FFA - CAIR continues to push Columbus Mayor, Police Chief to allow police officers to wear hijabs. Will Ohio become the first state in the Union to sanction hijabs for police officers? The email for this article was deactivated after the commission unanimously ruled in favor of police policy. Seven months have passed since CAIR filed a discrimination complaint with the Ohio Civil Rights Commission on behalf of a woman who wants to wear a hijab as an on duty Columbus Ohio police officer. In August, the Ohio chapter of the Council on American-Islamic Relations filed an employment-discrimination complaint over the scarf issue. 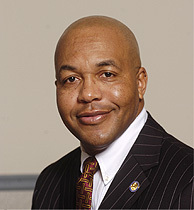 The group believes that the Ohio constitution and Ohio civil-rights laws allow people to express their faith even if they are government employees. "If the job of the police is to serve the community, it makes sense that the officer would look like the community," said Romin Iqbal, CAIR-Ohio's staff attorney. 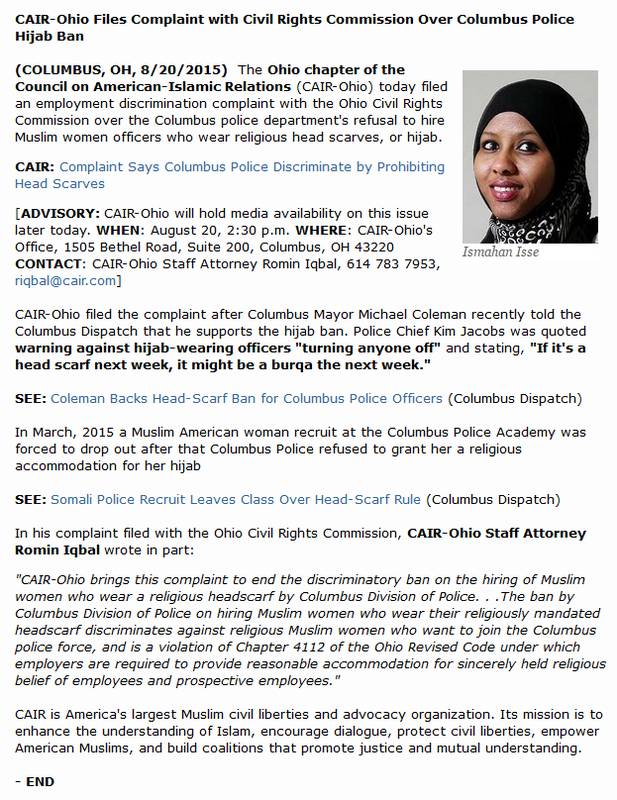 CAIR’s news release boasts about the October 22, 2015 article published in the Columbus Dispatch titled Groups say head-scarf ban for Muslim officers condones prejudice. The article states in part “Other cities, such as Edmonton, Alberta, in Canada, allow head scarves for female Muslim officers, designing a hijab that snaps off if grabbed.” Notice the article does not point out a police force in Ohio or the United States as an example of the policy CAIR demands. If CAIR succeeds in bullying officials into approving their demand Ohio will become the first state in the union to sanction hijabs for police officers. State of Ohio is investigating CAIR's discrimination complaint against the Columbus Police for not allowing their officers to wear hijabs on duty. Florida Family Association sent out an email alert on June 24, 2015 titled CAIR denounces Columbus Ohio Police Department for continuing to ban officers from wearing hijabs. The email and online Floridafamily.org article encouraged thousands of people to send emails to thank the Chief of Police, Deputy Chief of Police and Mayor. The emails thanked these officials for continuing a values neutral dress code for law enforcement officers by not opening the policy to allow hijabs, scarves and other cultural attire. The Columbus Ohio Police Department continued their “values neutral dress code” and did not allow variations from it, including hijabs. On August 20, 2015, the Council on American Islamic Relations (CAIR-Ohio) filed a discrimination complaint with the Ohio Civil Rights Commission. CAIR wants the State of Ohio to force the Columbus Police Department to change their "values neutral dress code" to allow for hijabs. CAIR's news release is posted at end of this article. Florida Family Association requested the status on the case from the Ohio Civil Rights Commission. However, the Ohio Civil Rights Commission declined to provide the current status of the case because of confidentiality rules even though CAIR highly publicized the discrimination complaint. The reply from the Ohio Civil Rights Commission is provided below. You have requested a status update on an employment discrimination complaint being investigated by the Ohio Civil Rights Commission. 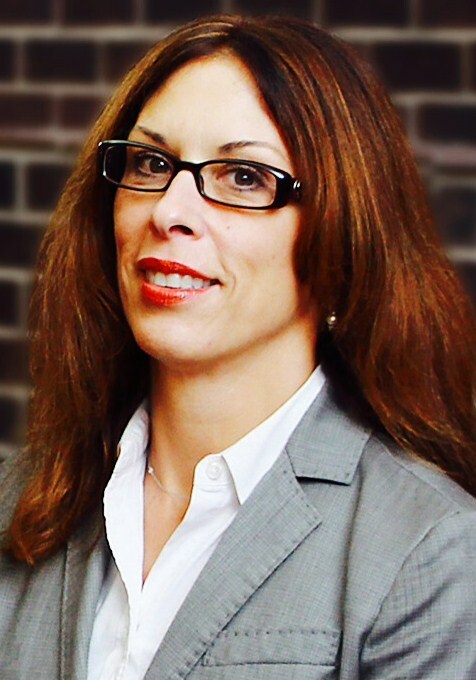 Ohio Revised Code Section 4112.05(B)(2) requires our agency to maintain all case information as confidential until there is a determination reached. We therefore cannot provide the information you have requested. I have no estimate of when the investigation will be done. Please note that our state law requires the investigation to be finished within one year from the date of filing. Wearing a hijab is clearly driven by culture and custom and is not a religious requirement. However, Islamists who want to Islamize America instead of assimilate into American culture are pushing these Sharia style customs. Most important of all in this issue is the public safety of the people police officers are sworn to protect. Only a values neutral dress policy can be certain to instill the best sense of security in the greatest number of citizens the police department serves. The badge of a law enforcement officer should be the only symbol that citizens see when an officer arrives to serve and protect. A values neutral dress policy eliminates how the average citizen may feel when they first see a police officer who is dressed in a dissimilar cultural manner. All five commissioners who serve on the Ohio Civil Rights Commission are appointed by the Governor of Ohio. Florida Family Association has prepared an email for you to send to encourage the Ohio Governor and Civil Rights Commissioners to uphold the Columbus Police Department's "values neutral dress code" for law enforcement officers. A copy of your email will also be sent to the Columbus Mayor, Chief of Police and Deputy Chief of Police. 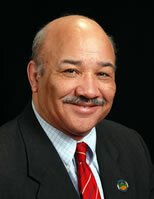 and reappointed in 2011 to a second term as Commission Chairman by Governor John Kasich. lhubert.com is blocking emails from the floridafamily.org server. 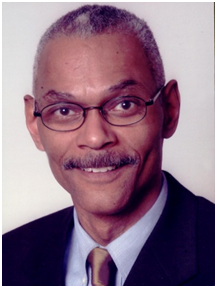 William Patmon III was appointed to the Commission by Governor John Kasich in August 2012.
to an unexpired term and reappointed in 2010. Madhu K Singh was appointed Commissioner on June 12, 2015 by Governor .